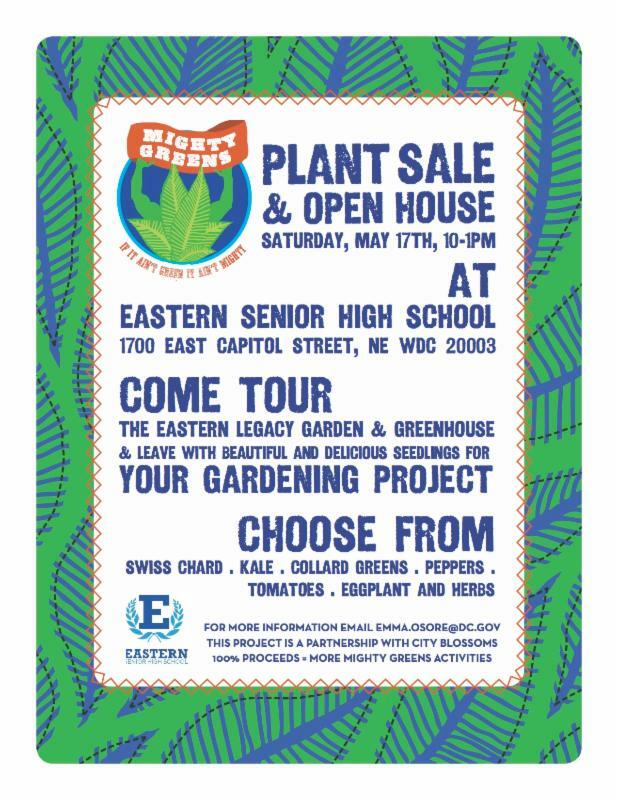 City Blossoms has been working with Mighty Greens at Eastern Senior High School to help develop their beautiful garden and greenhouse! Join us on May 17th from 10AM-1PM as Mighty Greens hosts a plant sale and open house. Congratulations to Eastern High School on becoming International Baccalaureate! 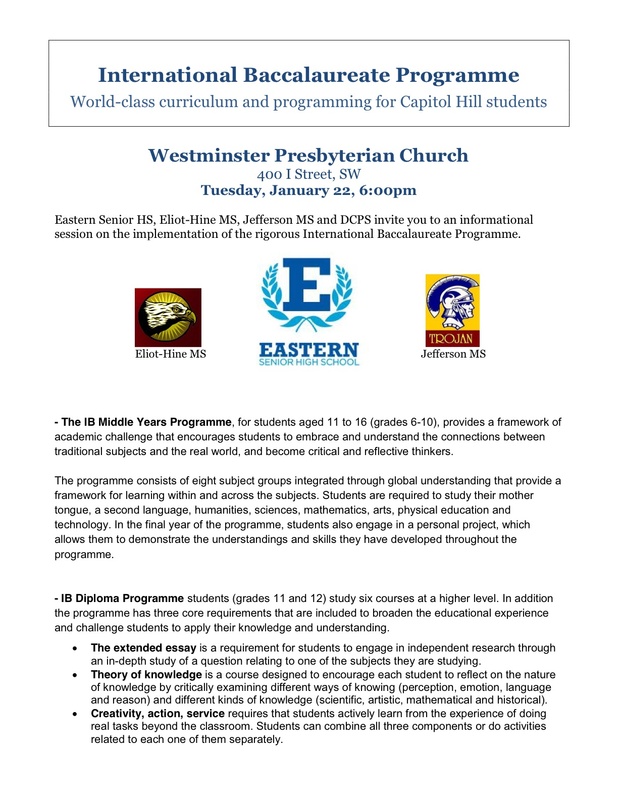 On January 22, leaders from Eastern Senior HS, Eliot-Hine MS, Jefferson MS and DCPS invite you to an informational session on the implementation of the rigorous International Baccalaureate Programme across Capitol Hill. This session will focus on the curriculum / course development – ensuring that we have strong academic programs for our children. We hope to see you on Jan 22. Please feel free to forward and invite your friends. The following was send to Councilmembers Mendelson, Evans, Brown with copies to CHPSPO members on May 25, 2011. As members of the Capitol Hill Public Schools Parent Organization (CHPSPO), we are voicing our extreme concern about the D.C. Council’s consideration of the proposal to divide Wards 6 and 7 at 17th Street from Benning Road to Barney Circle which would effectively move Eliot-Hine Middle School and Eastern High School from Ward 6 to Ward 7. We are opposed to this move because of the impact it would have on our neighborhood cohesiveness and the community’s efforts to strengthen our neighborhood public schools. CHPSPO started over six years ago, at a time when some Capitol Hill public elementary schools were bursting at the seams and others were woefully under-enrolled. A group of active parents from each school joined together to share common concerns and great accomplishments. It quickly became clear that our shared interests far exceeded any superficial differences. CHPSPO has established a strong record of working to support our neighborhood’s schools. The School Libraries Project, a $2.4 million public/private partnership with the DC Public Schools that renovated eight public school libraries on Capitol Hill was CHPSPO’s first success at supporting our neighborhood schools. This was followed by efforts to start 3 and 4-year-old programs at our elementary schools, and most recently a proposal to strengthen the middle schools. DCPS has said they want to replicate the community-driven process started by CHPSPO in wards across the city. Eastern Senior High School invites middle school students and their families to attend our information session where you will learn about the academic programs and activities for the Class of 2015, participate in a question and answer session, and receive a school tour. We are excited to launch a rigorous academic experience at our newly restored, state-of-the-art campus and look forward seeing you on Saturday, February 5th at noon. The event will take place at Eastern Senior High School, The Pride of Capitol Hill (1700 East Capitol Street NE). Please contact Rachel Skerritt, incoming principal, with questions at rachel.skerritt@dc.gov or by phone at (202) 939-5299.